On the night of February 12, 2008, a car bomb in Damascus killed Imad Mughniyeh, the head of Hezbollah's military wing. The assassination shattered the legend of Hezbollah's invincibility. Intelligence services of at least forty countries had pursued Mughniyeh for decades, and he had succeeded in evading them all. His elusiveness substantiated Hezbollah's claim that its enemies had no hope of finding cracks in the group's network or in the ranks of its faithful. Mughniyeh's death destroyed that myth. Since that fateful Tuesday, every child in Lebanon knows that whoever got Mughniyeh will be able to get to Hasan Nasrallah, Hezbollah's secretary-general, as well. At Mughniyeh's Beirut funeral, Nasrallah blamed Israel for the assassination and said the group's revenge would not be slow in coming. His emotive response is understandable. Not only was Mughniyeh's death a severe blow to Hezbollah—he was the group's terror mastermind and chief military strategist—but the shattering of the legend of Mughniyeh also lowered Hezbollah's standing and morale. 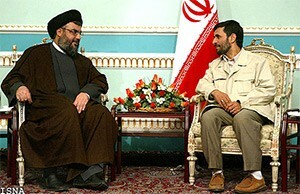 Hezbollah leader Hasan Nasrallah (L) and Iranian president Mahmoud Ahmadinejad meet in Tehran, August 1, 2005. Hezbollah is viewed increasingly as a Shi'i force serving as a tool, if not a fifth column, of Iran with the aim of advancing a host of Iranian interests. But Iranian disappointment with Nasrallah's conduct during and after the 2006 Israel-Hezbollah war and its belief that Nasrallah endangered Iranian interests by his un-calculated behavior has been evident in many reports in both the Lebanese and Arab media. For years, it has been customary to view Nasrallah as one of the canniest players in the Middle East. Under his leadership, Hezbollah achieved major successes and established itself as the leader of the Lebanese Shi‘i community and as the most capable terrorist group threatening Israel. Nasrallah became a respected leader not only to many Lebanese Shi‘a but also to Arabs and Muslims far beyond Lebanon's borders. Nasrallah built Hezbollah into an organization standing on two pillars. One pillar is its powerful, armed militia that focuses on the struggle with Israel, and the other is the organization's political and social activities, which aim to improve the lot of the Lebanese Shi‘a and, eventually, challenge the existing order in the country on behalf of the Shi‘i community. During the 1990s, Hezbollah became the leading power among the Lebanese Shi‘a, eclipsing the Amal movement thanks to the social, economic, and political infrastructure Hezbollah had developed. Election results to the Lebanese parliament and the local municipalities demonstrate this superiority. Since 2000, many in Lebanon and abroad have begun to suspect that Nasrallah seeks to take power in Lebanon by democratic means, exploiting the fact that his Shi‘i supporters constitute the largest community in the country, perhaps 35 to 45 percent of the total population. Indeed, following the U.S.-led invasion of Iraq, Nasrallah began calling for the implementation in Lebanon of a democratic system such as the Americans had brought to Iraq. Despite his shrewdness, Nasrallah has been a compulsive gambler for whom only one step separates success from catastrophe. For many years, he won, but in the summer of 2006, his winning streak was broken. First, he kidnapped two Israeli soldiers, Eldad Regev and Ehud Goldwasser, sparking war with Israel; second, he chose after that war to challenge the Lebanese government of Fouad Siniora, plunging Lebanon into a long crisis and Hezbollah into the murky waters of Lebanese politics. Nasrallah's gambles have transformed Hezbollah's identity and standing. The group gained the respect of many Lebanese, Arabs, and Muslims as it acquired the sheen of victory as a resistance movement. Now, however dominant Hezbollah is, it is developing into just another Lebanese political party, corrupted by its participation in day-to-day politics. Yet inside Lebanon, its record includes the terrible destruction it brought on the country through its unilateral actions. Worse, it is viewed increasingly as a narrowly-focused Shi‘i force serving as a tool, if not a fifth column, of Iran with the aim of advancing a host of Iranian interests—inside Lebanon, against Israel, and across the Sunni divide. Two years after Hezbollah's war with Israel, Lebanon is a divided country teetering on the verge of a civil war that is largely a result of Hezbollah's bellicosity toward Israel and its refusal to submit itself to the domain of politics with the rest of Lebanon. Hezbollah itself is a battered and bruised organization struggling to regain its standing inside Lebanon. Meanwhile, two other realities are indisputable: First, since the 2006 war, quiet has prevailed along the Israeli-Lebanese border such as has not been known there since the late 1960s, prior to the arrival of Palestine Liberation Organization (PLO) forces in Lebanon. This quiet derives above all from Hezbollah's wariness of Israel. The organization is concerned that it and its supporters will not be able to withstand the strain of a new round of fighting. The second reality is Nasrallah's disappearance from public events. Prior to the 2006 war, it was customary for him to participate monthly in more than dozen meetings. For example, in October and November 2005, Al-Manar television and the Lebanese National News Agency reported twenty-eight public meetings, speeches, or media events. His need to remain hidden is a blow to someone who depends on frequent public exposure, and it reinforces the perception of Hezbollah's vulnerability to assassination and sabotage. Indeed, rumors are rife of Iranian dissatisfaction with Nasrallah. On the eve of Mughniyeh's assassination, reports circulated that Tehran had supplanted Nasrallah's leadership with his deputy leader Na‘im Qasim. While both Nasrallah and Qasim denied the reports, Iranian disappointment with Nasrallah's conduct during and after the 2006 Israel-Hezbollah war and its belief that Nasrallah endangered Iranian interests by his uncalculated behavior has been evident in many reports in both the Lebanese and Arab media. In May 2000, Hezbollah reached the highest peak of its existence. On the night of May 24, 2000, the Israel Defense Forces (IDF) completed its retreat from the so-called security zone in southern Lebanon, a unilateral withdrawal undertaken without any agreements or commitments with the other side. For Hezbollah, this became both a great victory and a day of celebration. The IDF retreat from southern Lebanon gave Hezbollah new prestige. The organization was now viewed as the vanguard of the Arab struggle against Israel and as a rising force with a promising future both inside Lebanon and abroad. It was assumed that Hezbollah was destined to play a significant regional role, especially in view of the political and even ideological vacuum that characterized inter-Arab relations. In Israel, there were even some people who expressed concern that Nasrallah had his sights set on becoming a pan-Arab leader of the stature of Gamal Abdul Nasser. In October 2000, months after the Israeli withdrawal, Hezbollah renewed its attacks on Israeli targets, mainly in the Shebaa Farms region at the foot of Mount Hermon. With Iranian and Syrian help, Hezbollah had developed an impressive military capability that included an arsenal of 12,000 missiles with ranges covering all of northern Israel to Hadera. Hezbollah soon began to encourage and assist terrorist activities carried out by Palestinian organizations against Israel. Nasrallah has headed the Hezbollah organization since February 1992. His achievements stem both from political astuteness and his deep understanding of the strategic realities of the region. However, Nasrallah's hubris leads him to mistakes. Whatever successes he achieves encourage him to take more gambles. And like any gambler, he eventually lost. On the morning of July 12, 2006, Hezbollah fighters attacked an IDF patrol moving along the Israeli-Lebanese border. Nasrallah later admitted that he had thought at the time that the Israeli response would be minor, localized, and limited, like past Israeli reactions to similar Hezbollah provocations. Instead, the government of Israel launched an all-out war against Hezbollah. The war lasted thirty-three days and brought ruin and destruction not witnessed since the end of the Lebanese civil war (1975-90) on the Lebanese side of the border, from the towns and villages in the south to the Shi‘i suburbs of Beirut. The fighting killed close to 1,300 Lebanese civilians, together with perhaps 600 Hezbollah fighters. Nearly a million Lebanese became refugees, including most of the Shi‘i population of southern Lebanon. As the war ended, Nasrallah declared that Hezbollah had won a "divine victory." After all, Hezbollah had survived the Israeli assault and had quite a few successes in the fighting such as striking Haifa for the first time since 1948, as well as hitting the Israeli military vessel, Hanit, off the Beirut shore on the evening of July 14, 2006. However, the gains did not outnumber the losses. Hezbollah suffered severe blows during the fighting, hence Nasrallah's admission that if he realized there was even a one percent chance of a sustained military response from Israel, he would not have given orders to kidnap the Israeli soldiers. In Israel as well as in the West, Nasrallah is too often perceived only as the leader of a terrorist militia with several thousand fighters and rockets that seeks confrontation with Israel. Those who look at Nasrallah through that narrow prism believe that, as Nasrallah continued firing rockets into Israel until the last day of the fighting, he could legitimately be seen as the victor in the confrontation. However, Nasrallah does not simply see himself as the leader of an army. In both his own eyes and those of his followers, he was a symbol for the entire Arab if not Muslim world. As of July 11, 2006, he was the leader of a political and social movement—probably the largest in Lebanon—with deep roots in the Lebanese Shi‘i community. Hezbollah had fourteen representatives in the parliament, more than four thousand representatives in local municipal councils, an education system with dozens of schools and about one hundred thousand students, a health system with dozens of hospitals and clinics caring for half a million people a year, a banking system, marketing chains, and even pension funds and insurance companies. Nasrallah has devoted much of his energy in the last decade to building up his movement, or domestic empire, as it were. He viewed the creation of such an empire as his life's work, which would take him far, possibly even to a contest over the control of Lebanon. But, Israel set back Nasrallah's efforts. Hezbollah suffered perhaps US$4 billion damage to its institutions and enterprises while the damage caused to Lebanon was perhaps five times more. Despite such a result, Lebanese Shi‘a had no choice but to rally around Nasrallah. There was no one else in Lebanon let alone at the U.N. or in the international community who cared about them. Communal Lebanese government leaders focused on the interests of the Sunni, Maronite, and Druze communities even though these communities barely suffered in the war. However, the damage inflicted on the Shi‘a clearly reduced Nasrallah's room for maneuver, as evidenced by his admission at the end of the war. As the weeks and months passed, the degree of damage inflicted on the organization's military power also became clear. It was just as painful and significant as the damage done to the organization's political power. First, Israeli forces destroyed Hezbollah's stockpile of strategic missiles, primarily Zilzal unguided rockets from Iran, during the first moments of the Israeli attack on the night of July 12, 2007. Nasrallah had hoped to use these missiles against central Israel. This was a severe blow to the Hezbollah leader, who lost an important bargaining chip even before the campaign began. Indeed, the precision of Israeli intelligence, which enabled Jerusalem to strike at the organization's strategic stockpile, surprised Nasrallah. Second, Israeli assessments estimate that Hezbollah lost about a third of its elite fighting force. While Hezbollah has no difficulty attracting volunteers to its ranks, turning them into skilled military operators is a lengthy and complex process. Third, despite the mistakes made by the IDF in conducting the military campaign, Israeli soldiers triumphed in every face-to-face battle with Hezbollah. Nasrallah concealed these facts from the Lebanese people and perhaps even from Iran. Hezbollah fed reports of successes and victories to both audiences. Despite the false reports, however, Tehran likely realized the scope of disaster Hezbollah had suffered, and there is no doubt that Nasrallah himself grasped the extent of the damage that had been done to his organization and himself. In the wake of the 2006 war, the following facts have become clear: First, Hezbollah, which represented itself as the "defender of Lebanon," turned out to be its destroyer, due to the extensive devastation it brought down on the heads of the Lebanese people in the course of the war. Second, Hezbollah's deterrent charm was dispelled. The war made it clear that the organization could no longer carry out military operations against Israel along the Lebanese-Israeli border and expect Israel to refrain from retaliating. Third, Hezbollah was perceived more and more as a Shi‘i organization serving Iranian interests. Thus, there is nothing surprising in the fact that since the war, Nasrallah has devoted himself to repairing and rebuilding his power while, at the same time, taking greater care than ever before to preserve the quiet along the Lebanese-Israeli border. He has no desire to rekindle the confrontation with Israel until his position in Lebanon has improved. Indeed, Hezbollah used Israel's acquiescence to a prisoner swap in June 2008 to try to bolster its domestic position and to rebuild its reputation in Lebanon. However, critics in Lebanon pointed out the terrible price Lebanon paid for this deal during the 2006 war. Moreover, the U.S. and European efforts to resume negotiations on the question of the Shebaa Farms raised Hezbollah's fears that any deal would make it difficult to use the conflict with Israel to reestablish itself in Lebanon and in the Arab Middle East. It is not surprising that Hezbollah spokesmen both expressed reservations over any new deal and promised to continue the struggle with Israel regardless of whether Jerusalem returned Shebaa Farms to Lebanon. On November 9, 2006, the Amal and Hezbollah ministers serving in the government of Lebanese prime minister Fouad Siniora submitted their resignations in protest over the refusal of the Cedar Revolution coalition to submit to the demands of the Shi‘i organizations to establish a national unity government in which the Shi‘i representation would be increased and in which Michel Aoun, Hezbollah's loyal ally, would also be given representation. On the face of it, these looked like innocent, and even legitimate, demands aimed at advancing dialogue and understanding between the various Lebanese communities and wielders of power. However, if these demands were met and Nasrallah's representatives and allies received a third of the portfolios in the Lebanese government, then they would acquire veto power over any resolution the Lebanese government tried to adopt. During the two years that followed, Lebanon found itself mired in a crisis that paralyzed the entire political system. The trauma of the lengthy civil war that ended with the 1989 Ta'if agreement continues to play an important role in the public's consciousness. It impelled both Nasrallah and his opponents to act with restraint so as not to be perceived as responsible for the decline of the state into a new civil war, which would surely lead to a loss of support from their followers. Lebanese president Emile Lahoud's term of office ended on November 24, 2007, and for many weeks afterwards, Lebanese politicians could not agree on Lahoud's successor. Matters were complicated by the speaker of the parliament, Nabih Berri, who exploited his authority to prevent parliament from convening to elect a president. During the first months of 2008, all efforts to resolve the crisis and bring about the election of a new president failed. In the meantime, tensions between the rivals increased to the breaking point. Hezbollah-aligned unions declared a strike while the government adopted a resolution to dismiss Wafiq Shuqayr, Beirut airport's chief security officer, known for his close relations with Hezbollah, and to close down Hezbollah's independent communication network. Hezbollah considered the Siniora government's decision an unacceptable challenge, or as Nasrallah put it, as a declaration of war against the movement. Hezbollah thus decided to break the stalemate in Lebanon and to try to force on its enemies a solution to the crisis that would strengthen its own standing. On May 8, 2008, Hezbollah supporters took over the Sunni suburbs of West Beirut. Alongside the occupation of West Beirut, Hezbollah men took over the West Beirut offices of the Al-Mustaqbal party led by Said al-Din al-Hariri and shut down its television and radio stations in addition to setting fire to the building housing the party's newspaper, Al-Mustaqbal, which belongs to the media empire run by the Hariri family. In addition, Hezbollah, in a show of force, surrounded the residencies of Hariri and Walid Jumblatt, the leader of the Druze community. This was an impressive demonstration of the military might of Hezbollah, but most Lebanese already acknowledged the military superiority of Hezbollah over all its rivals, including the Lebanese army. Hezbollah's move was calculated and cautious: In order to signal that they did not wish the destruction of the Lebanese political system, Hezbollah supporters did not appear in uniform as organized forces and avoided attacking government buildings or clashing with the Lebanese army. Indeed, in a matter of two days Hezbollah evacuated their positions and left the streets of West Beirut, enabling the Lebanese army to deploy its forces there. But Hezbollah's impressive victory over its rivals was pyrrhic. The challenge facing Hezbollah is not and never has been the occupation of West Beirut. Its challenge is to win the hearts of the Lebanese people, especially those who are not part of the Shi‘i community. Those Lebanese who regarded Hezbollah with mistrust and resentment now regard it with hatred. Fouad Siniora discovered that in his weakness there is much strength and that his unwillingness to fight Hezbollah militarily won him the support and empathy of many in Lebanon and in the Arab world at large. Many Lebanese noted that while Hezbollah had refrained from firing a single bullet at Israel since the end of the 2006 war, it had turned its weapons on Lebanese in West Beirut, an event more in the interest of the Iranian government than that of the Lebanese people, regardless of sectarian preference or political outlook. The May 2008 violence, which cost the lives of more than one hundred Lebanese, shows that no one in Lebanon has an interest in a renewed civil war. It was only a few days before an Arab reconciliatory effort began, which led to an all-Lebanese summit in Doha, Qatar. On May 23, 2008, the summit produced the Doha agreement, which enabled the election of Michel Suleiman as Lebanese president two days later. Other parts of the agreement dealt with the establishment of a unity government, in which the opposition headed by Hezbollah would have one third of the seats and thus the power to veto all government decisions, and understandings regarding the election law for the forthcoming 2009 parliamentary elections. The total break has thus been delayed until the next time. Lebanon has weathered the struggle over the identity of the president and is now facing the struggle over the composition of the government. But it also must face the yet-to-come struggle over the parliamentary elections scheduled for spring 2009. Altogether, these flash points should be viewed as a prelude to the much more significant struggle over who is to rule Lebanon and what Hezbollah's role in Lebanon will be. As time passes, the severity of the blow suffered by Lebanon and its people from the 2006 Israel-Hezbollah war becomes clear. The war resulted in a political crisis in Lebanon that continues to threaten to deteriorate into civil war, this time between the Shi‘i community and the country's other groups. True, the war did not engender this crisis; its roots lie in deep, long-term problems that have been unfolding in Lebanon for some time. However, there is no doubt that the war intensified existing tensions, exposed wounds that had scabbed over only with great difficulty, and created new political and social resentments. Precisely because the Shi‘a will become the majority in Lebanon within a few years, the power struggle between Hezbollah and the Amal movement for primacy among the Shi‘a is of the utmost importance. Surveys conducted in Lebanon shortly after the end of the war indicate support of up to 65-70 percent among Shi‘a for Hezbollah under Nasrallah's leadership. However, the same surveys also show that the organization's hard-core supporters comprise no more than 25-30 percent of the community. This means that most of the members of the Shi‘i community are not necessarily in Nasrallah's pocket, and they might transfer their allegiance from Hezbollah to Amal if Amal can offer them the same hope that Hezbollah once embodied. The Amal movement believes in the integration of the Shi‘a into Lebanese life while Hezbollah represents a radical outlook imported from Iran. Though the economic aid that Iran provides Hezbollah has allowed the organization to become a leading force within the Lebanese Shi‘i community, an internal Shi‘i conflict between Amal and Hezbollah has by no means been averted. Thus, in several respects, Hezbollah and its leader find themselves in deep trouble, fighting a rearguard action in order to maintain themselves and regain the status they enjoyed on the eve of the 2006 war. However, no one should think that the organization or its supporters are going to disappear. They will continue to be a permanent factor in the Lebanese equation. The challenges presently facing the organization are not simple, nor are the challenges facing Nasrallah. For him, Hezbollah is his life's work, yet he has gotten the organization into deep trouble by his badly calculated gambles. Once a gambler, always a gambler; it is likely that Nasrallah will take risks again and, again, make big mistakes. Still, the real challenge seems to be the one confronting the Lebanese state: How will the government, along with the various Lebanese communities, deal with the Shi‘i community? Will they work to enable that community to live in dignity and integrate more fully and justly into the Lebanese system? Hezbollah will remain the most powerful force in Lebanon. But it is weaker and more vulnerable than many Israeli or Western officials admit. Since the 2006 war, Hezbollah has become more aware of its limits and weakness. It is more careful, calculating, and prepared to gamble on the demographical changes that will eventually give it victory in the internal struggle for control of Lebanon. For the time being, it is keeping the border with Israel quiet and prefers to play its winning card—a sophisticated propaganda machine—that has given Hezbollah a victorious image time and again in the past. Where does this all take Lebanon? The answer to this question depends on the other Lebanese actors, some of whom, like Michel Aoun, are cooperating with Hezbollah for short term tactical gains, and on regional and international actors, who have failed until now to confront Hezbollah and to use its weakness to the advantage of Lebanon and the Lebanese. Western officials do have a winning card to play, however. By revealing the organization's weakness and its failures, they can begin to neutralize Hezbollah's propaganda machine and begin to puncture inflated Arab and Lebanese perceptions of Hezbollah, the first steps necessary to neutralizing the threat it poses to Lebanon and to regional stability. Eyal Zisser is director of the Moshe Dayan Center for Middle Eastern and African Studies at Tel Aviv University. Al-Manar television (Beirut), Feb. 13, 2008; Al-Jazeera television (Doha), Feb. 13, 14, 2008. Al-Nahar (Beirut), Nov. 9, 2006. For more on Hezbollah's role in Lebanon, see Ahmad Nizar Hamzeh, In the Path of Hezbollah (Syracuse: Syracuse University Press, 2004), pp. 44-79; Judith Palmer Harik, Hezbollah, The Changing Face of Terrorism (London: I. B. Tauris, 2004), pp. 43-110; Hala Jaber, Hezbollah, Born with a Vengeance (New York: Columbia University Press, 1997), pp. 145-68; Amal Saad-Ghorayeb, Hizbullah, Politics and Religion (London: Pluto Press, 2002), pp. 16-33; Na‘im Qasim, Hezbollah, Al-Minhaj, at-Tajruba, al-Mustaqbal (Beirut: Dar al-Hadi, 2002), pp. 298-321. Hasan Nasrallah, interview in Al-Ra'y al-‘Amm (Kuwait), Dec. 27, 2004; Al-Manar, Jan. 4, 2004. Asharq al-Awsat (London), Aug. 22, 2006, May 11, 2008; Al-‘Arabiya television (Dubai), May 7, 2008. Ha'aretz (Tel Aviv), Jan. 12, 2008, Asharq al-Awsat, Jan. 13, 2008. Al-‘Arabiya, May 16, July 21, 2008; Al-Mustaqbal (Beirut), July 12, Aug. 18, 2008. Ha'aretz, May 26, 2000; Yedi'ot Aharonot (Tel Aviv), Oct. 8, 2000. Daniel Sobelman, New Rules of the Game, Israel and Hezbollah after the Withdrawal from Lebanon (Tel Aviv: The Jaffee Center for Strategic Studies, 2003), pp. 57-74. Reuters, Sept. 12, 2006; Al-Hayat (London), Sept. 13, 2006; "Country Report—Lebanon," The Economist Intelligence Unit, no. 4 (2006), pp. 3-6. Yedi'ot Aharonot, July 15, Aug. 6, 2006. Al-Manar, July 14, 2008; Ha'aretz, July 16, 2008. See Hasan Nasrallah's remarks on Nasser, Al-Mustaqbal television (Beirut), Aug. 13, 2005; Al-Jazeera, Sept. 22, 2006, July 12, 2007. Hamzeh, In the Path of Hezbollah, pp. 44-79. Yedi'ot Aharonot, July 14, 2007; "Country Report—Lebanon," The Economist Intelligence Unit, no. 4 (2006), pp. 3-8; Yoram Schweitzer, "Divine Victory and Earthly Failures: Was the War Really a Victory for Hizbollah," in Shlomo Brom and Meir Eliran, eds., The Second Lebanon War: Strategic Perspectives (Tel Aviv: Institute for National Security Studies, 2007), pp. 123-34. Amos Harel and Avi Issascharoff, Korey Akavish, Sipura shel Mmilchemet Levanon (Tel Aviv: Yedi'ot Aharonot, 2008), pp. 179-81. Lebanese National News Agency, Aug. 19, Dec. 17, 2006; Yedi'ot Aharonot, Aug. 15, 2007. Harel and Issascharoff, Korey Akavish, Sipura shel Mmilchemet Levanon, pp. 443-5. See, for example, "Evaluation of 24 Days of Zionists' Invasion of Lebanon," Fars News Agency (Tehran), Aug. 6, 2006. Al-Nahar, Nov. 9, 10, 15, 2005; Al-Mustaqbal, Nov. 17, 2006. Lebanese National News Agency, Feb. 5, 6, Nov. 9, 2006; Reuters, Nov. 13, 2006; Al-Manar, Nov. 15, 20, 2006. Al-Mustaqbal, Nov. 24, 27, 2007; As-Safir (Beirut), Nov. 27, 2007; Reuters, Dec. 12, 13, 2007. Lebanese National News Agency, Aug. 6, 7, 2008. Al-Jazeera, May 8, 9, 2008. Al-Jazeera, May 8, 2008; Al-Nahar, May 9, 2008. Al-Manar, May 9, 10, 2008; Al-Nahar, May 10, 11, 2008. Asharq al-Awsat, May 10, 2008; Al-Ahram (Cairo), May 9, 10, 2008. Al-Jazeera, May 8, 2008; Asharq al-Awsat, May 9, 2008. Al-Nahar, May 23, 25, 27, 2008. Al-Akhbar (Beirut), Sept. 20, 2006; Al-Nahar, June 11, 2008. Augustus Richard Norton, Amal and the Shi‘a: Struggle for the Soul of Lebanon (Austin: University of Texas Press, 1987), pp. 71-83; idem, Hezbollah (Princeton: Princeton University Press, 2007), pp. 32, 42-6, 110-11. Related Topics: Arab-Israel conflict & diplomacy, Lebanon | Eyal Zisser | Winter 2009 MEQ receive the latest by email: subscribe to the free mef mailing list This text may be reposted or forwarded so long as it is presented as an integral whole with complete and accurate information provided about its author, date, place of publication, and original URL.